Driving down the endless coast of Mozambique we are slowly but surely making our way home. Even though you know a trip like this will inevitable change something or everything about you, it sneaks up on you and all at once your life before you came seems light years ago. Your once important routine now seems vaguely familiar and all you notice is the vast enormous world all caught in their own mundane routine. Somewhere in the middle of your new routine of packing out everything you need in the cruiser and rearranging your toiletries in your vanity bag, you realise that we are all so similar even with such stark differences. You realise that given these people unique situations and frame of mind they too are doing what they can to get what they want and that’s all we are…a collection of unique needs shaped by where we are and what we have. I realise that in a poor area like North Horr your needs are so simple but yet so important and in my world some needs seem so important but can be completely simple. Ultimately we are a creation of our surroundings and what we choose to find important. We tend to overcomplicate our needs and fail to see that; like Ecclesiastes says, “all things in life come to nothing”. ..find what makes you happy and do that, try not to overcomplicate it. Yes, some routines are more necessary than others but it all comes down to small truths and little pleasures. Just a thought. Part two of our Tanzanian route started in the north-eastern part of the country just east of the Serengeti National Park. Oom Nick and Tan Lil visited both Serengeti and Ngorongoro Parks previously and Marius and I decided that we saw enough wildlife in South Luanga andBotswana. We were however hoping toseeMt.Kilimanjaro on our way to the coast but alas it was hiding underneath a cosy blanket of clouds for the two days we were there. I include a picture of Mt Meru which is next to Kilimanjaro and about 500m less in height at about 5200m. A long drive from Moshi brought us to Pangani on the North coast of Tanzania. It was our first glimpse of theIndian oceanand I was delighted. We stayed at a place with the funny name Tinga Tinga (which I later found out was a type of art) and is happy to report that we found a missing piece of the series ‘Lost’. Apparently there is still people living in there….we never saw them….We had to try and get the best place and way to get to Zanzibar and therefore asked around in Pangani for some info. The ‘tourist office’ consisted of a guy sitting on a stoep with a cell phone. When we asked him about transfers to Zanzibar he was nice enough to show us the ferry that would take us there for U$130. It looked pretty much exactly like the one that took us to Gombe and considering our previous experience and the fact that it was 80km of open sea, we opted not to take this attractive option. That night after crossing the Pagani river by ferry, we stayed over at a place just south of at Usongo beach for two nights to wash some clothes. Unfortunately their fresh water was almost as salty as the ocean which made washing clothes (and ourselves) a rather sticky situation……and even further complicated by the rain. Luckily we had some entertainment from the resident horses getting their daily exercise which made for some nice photos. We found out that it was possible to take a proper ferry toZanzibarfrom there but that the transfers were to the top of the island and not toStoneTown. 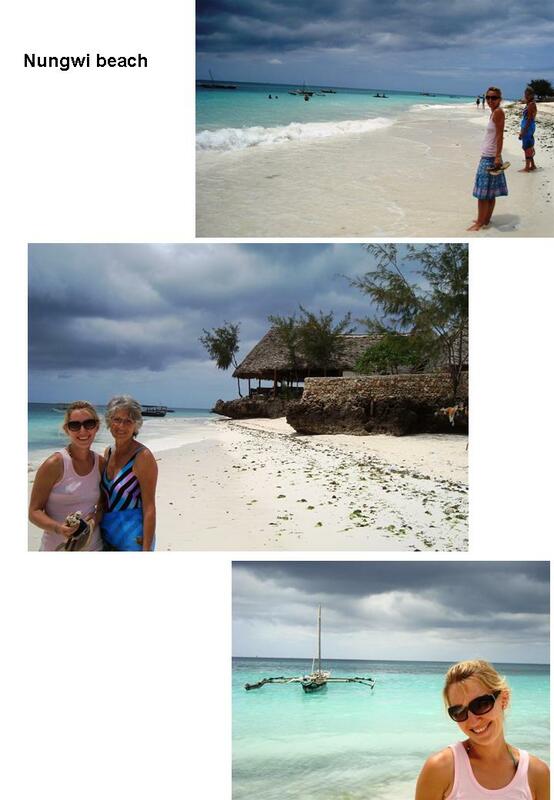 The only alternative was to take a ferry from Dar es Salaam, so the next day we made the long journey South. We got to the Dar (as the locals call it) late that night and was surprised at the type of accommodation that people can ask money for. A somewhat run down hotel with a campsite on the shore and rather disgusting facilities was a sight for sore eyes after such a long drive. Yet again we managed to enter a big city on a Sunday and couldn’t get any information about a transfer to Zanzibar until the Monday. The city was in much better shape than Nairobi and we could clearly see the South African influence when we walked into the mall and found Game and Shoprite. We decided to try the accommodation south of Dar, as those to the north was obviously lacking. To get to the south you cross a channel with a vehicle ferry. It worked quite efficiently once you get to the front of the queue, but we still wondered why they don’t just build a bridge… TheSunrisebeach resort was a big step up from the previous night’s accommodation and we were lucky enough that the manager there could arrange for our transfers to and accommodation in Zanzibar. We could even leave the cruisers at the reception parking lot at no extra cost. We left for Zanzibaron a Tuesday morning each armed with one bag (ok, I had two). Our transfer boat, the Kilimanjaro II was a huge catamaran that looked much more impressive than our previous boat… As we were in the front of the queue, we got to sit on the upstairs deck giving us a great view of port. 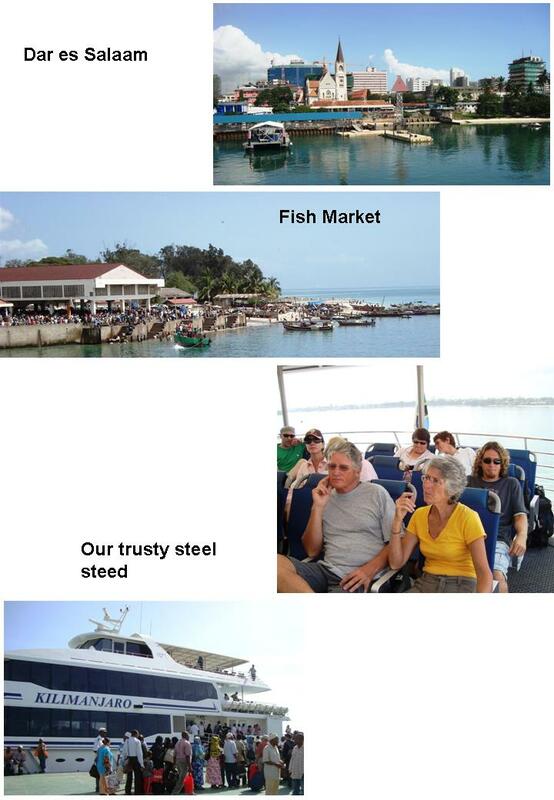 A lovely two hours later on very calm seas we got to the Stone Town port. From this point forward I will try to divide the diary into my experience and everyone else’s experience of the place. 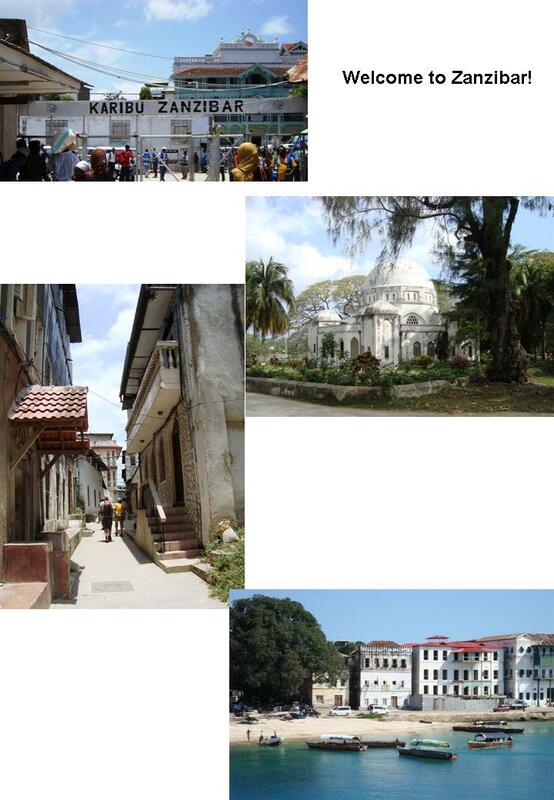 Stone Town represents only a very small part of the island but is the most populated and can be more accurately described as a giant maze of old buildings in various degrees of decay. Our friendly guide Harish walked us to our little hotel called Narrow street hotel located in a truly narrow street. The town itself has an outer ring-road suitable for vehicles but the interior can only be explored on foot or scooter. That Tuesday afternoon in the blistering sun, we basically walked through the whole town whilst being hassled to buy something by every single local. It really was the most annoying and off-putting part of Zanzibar as they would even become angry and insulting if you didn’t want their goods. It was pretty interesting to see people living in these little holes with large heavy wooden door covering the entrance. In the olden days, the intricacy of carvings on your door was directly related to your wealth and you could see that ‘some animals were more equal than others’. We wondered what we would do for the next four days (some more than others) and decided to find out about hiring scooters the next day. We were all happy to get on the scooter early the next morning to drive to the north of the island. 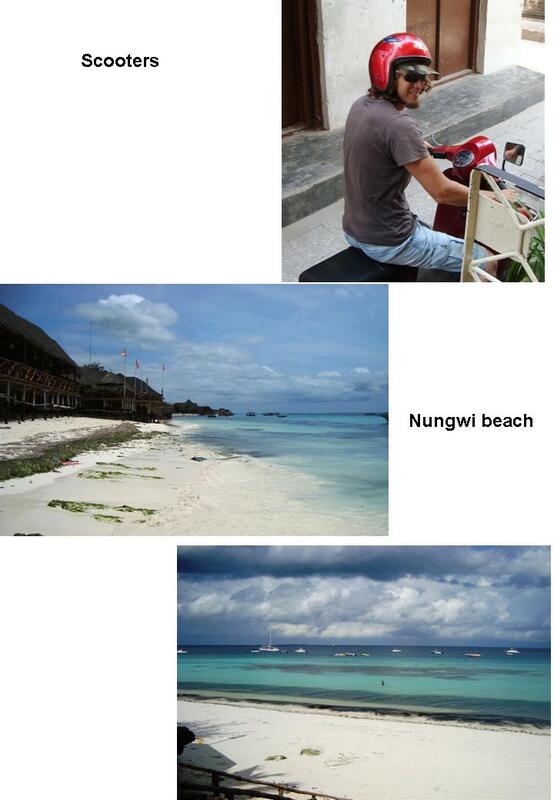 We were heading for one of the main tourist beaches in Zanzibar called Nungwi. Racing along at a top speed of 60km/h, the drive there was super fun. Although the Vespa’s offroad capabilities were rather limited and we had some close calls on the sand tracks, you don’t have anything to moan about with a consumption of 35km/L! 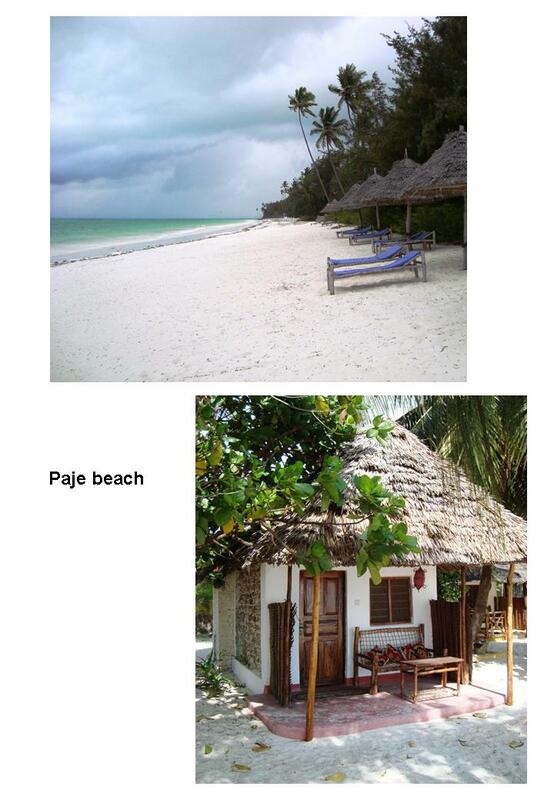 We got to Nungwi in no time and stayed there at a place that lived up to its name….the Paradise Beach resort. It really looked like the beaches that you see in the movies. It had white powder sand and the ocean was the most beautiful shade of blue imaginable! Tan Lil and I tried to work on our tans but it was slightly overcast and when the sun finally appeared it was late afternoon. Nevertheless, it was hot and humid and after a swim we finally decided that a wee afternoon nap would be in order. 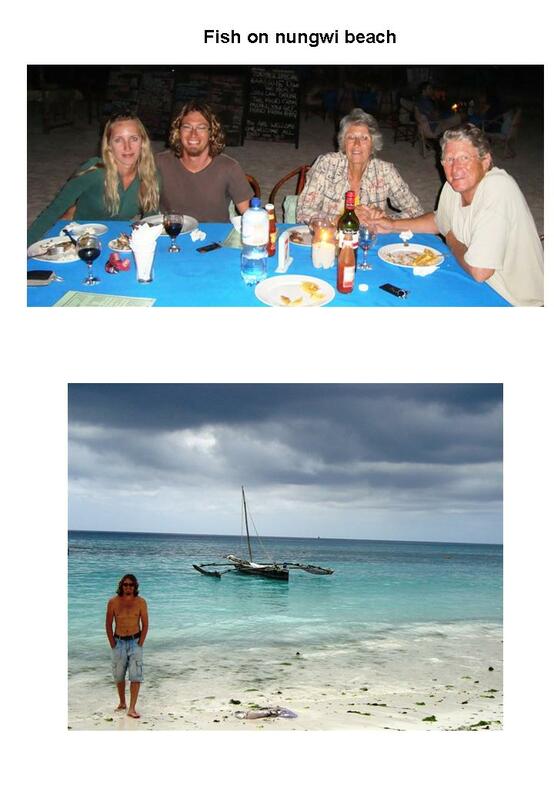 That night we could choose between fresh tuna, sera and kingfish (I think its what we call Kingklip?) which they then grilled and served to us on the beach by candlelight. The fish was great! The next day after a nice breakfast, we left for the west coast to a place called Paje. It was a bit further than we drove the first day and island weather resulted in light rain more than once on the way there. There are around 20 places to stay on this side of the island and we had too many choices. We drove up and down until the sweat was dripping and finally ended up staying at the second place we looked at. I didn’t think it could get any better than Nungwi, but it did. The beach had even finer white sands and the ocean was a turquoise you only see in auto corrected photos. We had a lovely little cottage right on the beach and I was sad to leave for Stone town the next morning. After a day of R&R we headed south to the relatively remote South coast of Tanzania. I’m not sure why but that morning it was the first time that it felt like we were going home. We had turned South a good 1500km prior to this but it seemed as if we had now seen what we wanted. The South Coast of Tanzania has little more to offer than a few historic Portuguese ports and, considering the state of the roads going there, sees few visitors. 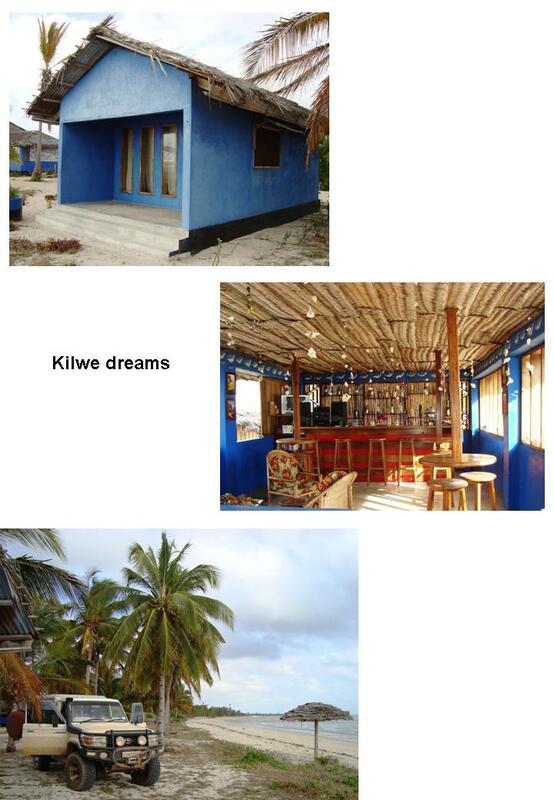 Kilwe was our first stop and we stayed at a very nice little place called Kilwe Dreams resort. The place was clean and the owner did a great job with the décor giving the place a real beach feel. The next day we drove to what we thought would be our last stop inTanzania. We got to the quant little town called Mikandani late that afternoon and was surprised to see that neither of the two accommodations there had a campsite as indicated on the GPS. The Old Boma at Mikandani was nice enough to offer us a place to stand and a swim in their pool to feel a little cleaner. Another surprise we got was the fact that the border crossing into Mozambique which we were heading for could no longer be used for vehicles. Apparently the ferry had sunk about 3 years ago and since then vehicles were using another crossing 150km west. Unfortunately this meant a 250km detour for us! We spent our last night in Tanzania bush camping in a quarry and left early the next morning for Mozambique.